Carton Flow Rack is a Mallard gravity flow solution used for efficient, accurate case and each picking. Also known as “case flow” or “tote flow” rack, carton flow operates in a similar way to pallet flow rack – relying on durable rollers or wheeled tracks, carton flow uses separate load and pick aisles to ensure productive, FIFO order fulfillment directly at the pick face. Carton flow rack is easily integrated with other material handling systems and can triple the number of case pick locations compared to traditional pallet rack. Now that we know what carton flow racking is, let’s see if it’s something you need in your material handling storage mix. Our floor and 1st level pallet rack locations are being underutilized with full case and partial case picks of slower moving SKUs. Solution: Convert floor level bays to carton flow. 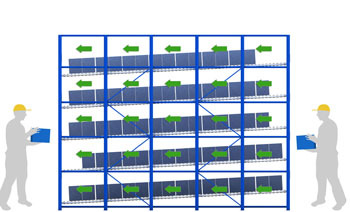 By converting floor level pallet rack positions to carton flow rack you can gain up to 40 case pick locations per bay vs. standard pallet rack positions. Increasing your working capacity will help achieve inventory goals and eliminate dead-space of partially full pallets. We need to boost order fulfillment productivity (case pick rates). Solution: Reduce travel time and improve picking efficiencies with carton flow. Carton flow racking can reduce forklift travel time by 75% vs. selective pallet rack. Case and each picking is condensed within a smaller footprint for more efficient, faster order selection. Gravity-fed, FIFO inventory rotation puts cartons directly at the aisle face, providing better visibility and easier, more ergonomic reach vs. bending or straining to access cartons from selective rack decking. The image below provides a great illustration of carton flow’s space-saving efficiency. We need to accommodate frequent product line additions and SKU changes within our current space. Solution: Install Mallard’s Dyna-Flo full wheel bed carton flow shelves designed for a variety of changing carton shapes and sizes. Dyna-Flo and Dyna-Deck (Mallard’s replacement carton flow system) are easy to install and add more case picking flexibility in order to handle SKU changes within existing space. A Mallard customer recently encountered this common challenge and reached out to our testing lab to develop a solution for them. 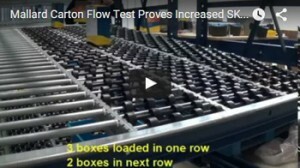 Mallard’s testing lab was able to provide an adaptable Dyna-Flo carton flow solution for this technologies company, check out the blog here and watch our test video. We need to accommodate temporary/seasonal inventory or production requirements. Solution: Utilize Mallard carton flow work cells or stand-alone unit. Stand-alone carton flow is a perfect solution for accommodating temporary inventory fluctuations and seasonal SKU fulfillment. 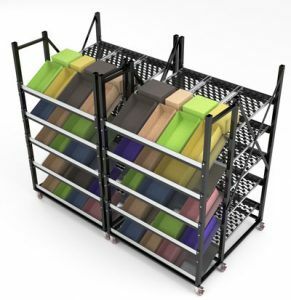 It is easy to assemble and/or reconfigure, can be designed as stationary or mobile system and is also an ideal solution for low ceiling or mezzanine applications. We need to implement environmentally efficient strategies to reduce our warehouse carbon footprint. 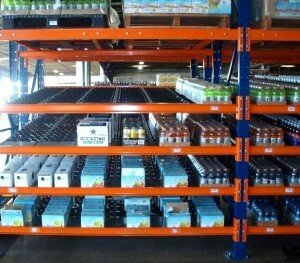 Solution: Install carton flow racking to maximize space, efficiency and reduce operating costs. Powered by gravity alone, carton flow racking is an energy efficient storage medium that maximizes space to reduce operating costs. Carton flow also requires fewer material handling vehicles for order selection, further decreasing energy consumption and equipment costs. Once cases are loaded into the carton flow racking, wooden or plastic pallets are freed up to be used where needed thus reducing the physical number of pallets required to support your inventory. Have you seen any of these “signs” in your warehouse? If so, just call one of our carton flow experts to see how Mallard carton flow rack can help optimize your space and order picking efficiency.